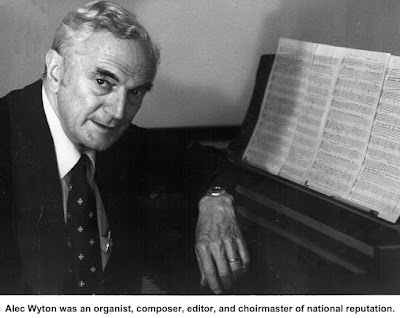 Alec Wyton was a musician, composer and professor whose 40-year career included two decades as organist and choirmaster at New York's Cathedral of St. John the Divine. Wyton composed more than 100 works, oversaw the rewriting of the Episcopal hymnal, and earned national recognition in the field of sacred music. He spent his last years with St. Stephen’s Church in Ridgefield. Born in London, England, in 1921, Alec Wyton (pronounced WYE-ton) was raised by an aunt after his parents separated. She encourage his early musical training, which included learning the piano and organ, and performing as a boy chorister. He got his first job as an organist at the age of 11. He earned a bachelor's degree from Exeter College, Oxford, in 1946 and a master's in 1949. After assignments as an organist and choirmaster in England, he came to the United States in 1950 to create a boys choir at what is now St. Mark's School in Dallas, Texas. In 1954 Wyton was appointed organist and master of the choristers at New York's Cathedral of St. John the Divine, a position he held for 20 years. Several months after his appointment, he took on the additional responsibility of headmaster of the Cathedral Choir School, holding that position until 1962. Wyton founded the Church Music Department at the Manhattan School of Music in 1984, serving as chairman until 1990. He had also been adjunct professor of sacred music at Union Theological Seminary from 1956 to 1973. Wyton left the Cathedral of St. John the Divine in 1974 to become organist-choirmaster of St. James' Church in New York City. At that time he also became coordinator of the Standing Commission on Church Music that produced The Hymnal 1982 for the Episcopal Church. Complementing a new prayer book that had come out in 1979, it replaced a 1940 hymnal and has been used by Episcopalian churches across the U.S. ever since. Wyton left New York City in 1987 to become minister of music at St. Stephen's Episcopal Church in Ridgefield, retiring in 1997 at age 75. He also made his home here. Besides playing the organ and leading the choir at St. Stephen’s, he organized concerts with many guest artists and enriched the musical life of the community. Dirk Bollenback, who sang in St. Stephen’s Choir under Wyton, said he believed it was during Wyton's years at St. John the Divine that he first got to know Ridgefield, bringing the boys in the cathedral's choir out to sing at St. Stephen’s. “The boys in the choir at St. John would sing at one of services on a summer Sunday and then spend the day here, out of the city,” Bollenback said. Wyton died in 2007 at the age of 85. His survivors include a son, Richard Wyton, an internationally known flutist and expert on historical keyboard instruments.